Learning about history can be adventuresome and fun…especially when you throw in some tents, roasted marshmallows, tales from the past and starry skies! 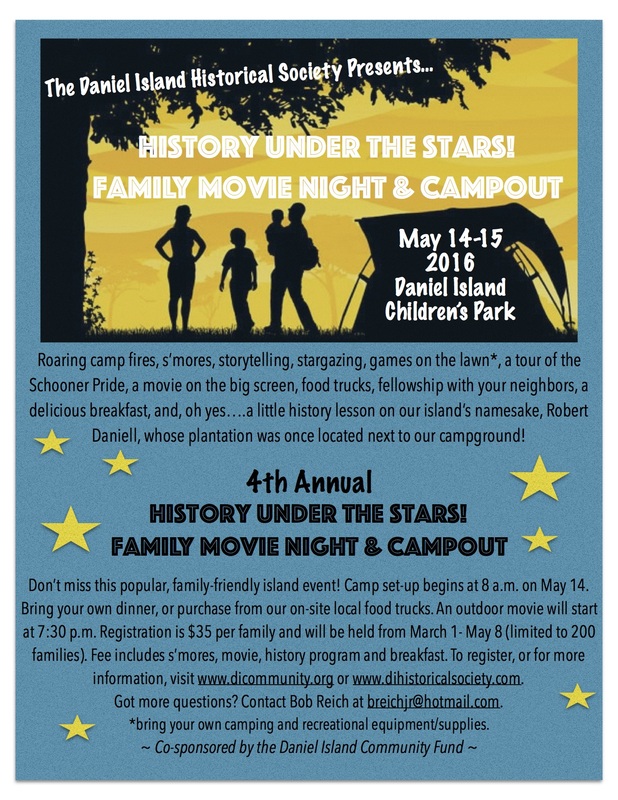 We debuted our “History Under the Stars: Family Movie Night and Campout” in 2013, when more than 50 families set up camp near the Daniel Island Children’s Park for an unforgettable experience. 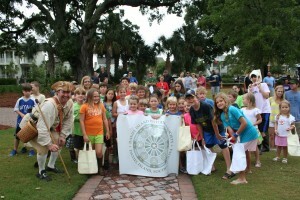 Sponsored by the Daniel Island Historical Society and the Daniel Island Property Owners Association, this popular event features a “tent village,” fire pit, an outdoor showing of a family-friendly movie, and an engaging storytelling session or demonstration highlighting Daniel Island history. For our 2014 and 2015 events, we gathered at Smythe Lake, but this year we are heading back to Daniel Island Children’s Park on the banks of the Wando River. 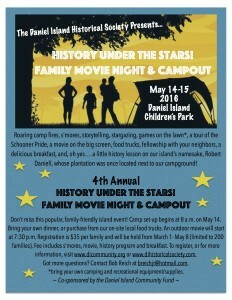 Our 2016 History Under the Stars Family Movie Night & Campout will be held May 14-15. Click on the flyer below for more details! Click on the orange button to the right to register for our 2016 event!